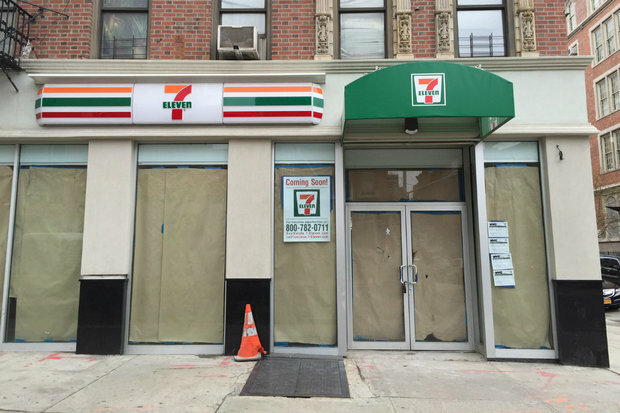 EAST HARLEM — A 7-Eleven will be the first store to open in a building that stood vacant for more than a year after the landlord pushed out eight small businesses to make room for renovations. East Harlem's second 7-Eleven will open at 1642 Lexington Ave. by the 103rd Street station next month, according to Margaret Chabris, spokeswoman for the store. The chain will take over space once home to three different businesses — a Mexican restaurant, a barber shop and a religious artifact store, also called a botanica. The businesses were forced to move out when the landlord refused to renew their leases in November 2013, according to Jorge Vargas, 68, who had owned the botanica since 1954. Vargas' shop, called Justo Botanica, sold religious candles, statues, herbal remedies and oils. His clients also relied on him for spiritual and medical advice, Vargas said. He used herbs and oils as ways of healing the neighbors who sought his help, he said. He learned the remedies from his father, who opened one of the city’s first botanicas in 1930, soon after moving to El Barrio from Puerto Rico, Vargas said. Vargas was one of the lucky ones. Since the 2013 store closure, he has reopened in a storefront on Lexington Avenue between 106th and 107th streets, he said. The three businesses that shared the space where the 7-Eleven is opening weren't the only ones forced to shutter. The entire ground floor of 1642 Lexington Ave. was filled with family-owned shops, including a hair salon, a discount store and a shop that sold custom plastic coverings for furniture. Those shops were converted into two bigger storefronts, which have stood empty since the businesses closed in fall 2013. The block on East 104th Street between Lexington and Park avenues has a lot of personal history for Andrew Padilla, a resident of the area who documents gentrification in East Harlem and throughout the country. "I got my first haircut at Felipe's barbershop. My mother would go shopping at that discount store." he said, referring to the shops that are now being used as space for the 7-Eleven. When Padilla was a kid he thought the "Candles" sign in front of Vargas’ botanica read "Candies" and was shooed out when he went inside the spiritual store asking for snacks, he said. Padilla offers gentrification tours of East Harlem and often stops at 104th and Lexington because it is such a blatant example of what happens when businesses don’t have protection, he said. Although Vargas was able to find another place just three blocks away, he's still worried about the spread of empty storefronts. Sandra Marrero, 46, is another business owner displaced in 2013. She ran the beauty shop on Lexington Avenue for 20 years. Although she was sad to leave and is still upset with the landlord over the way it was done, the move turned out for the best. But not all businesses were as lucky. Her neighbor, Tito’s Plastic Cover, was not able to find another place and the owner now runs his business out of his own house. Marrero keeps a stack of his business cards in her salon to send customers his way whenever she can. As far as the 7-Eleven coming into the block, she is glad that a business is finally opening up after two years. “Yea [I’ll stop by]. Why not?” she said. “They didn’t do anything to me."